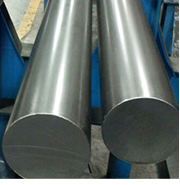 Northlake produces and stocks a diverse range of cold finished round steel bars. With one of the largest size and length capabilities in the industry, we produce sizes from 0.158" (4mm) through 16’’ round and lengths up to 75’. 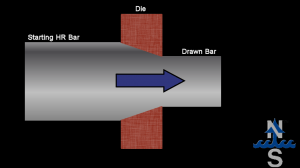 All bars are cleaned by shot blasting before drawing, then pulled through a carbide die, straightened, saw cut to length, oiled, and shipped. Cold drawing results in a product with higher tensile and yield strength, smoother surface finish, and a closer size tolerance. Our Cold Drawn bars meet or exceed the standards set forth by ASTM A108 (ASTM A108-18, Standard Specification for Steel Bar, Carbon and Alloy, Cold-Finished, ASTM International, West Conshohocken, PA, 2018). Cold drawing size capabilities range from 1” through 6” Rd in diameter, lengths up through 40’. We do not have a shape straightener, but have been able to cold draw shapes straight enough for our customers to use right off the draw bench. We are also drawing Squares, Flats, and Hex shapes. We can draw all carbon and alloy grades. Northlake can also furnish Turned & Drawn bars for customers who require seam and decarb-free surfaces. We carry several large diameter, cold drawn items in our finished stock inventory. These include 4” 1018/1045, 5” 1018, 5-1/2” 1018, and 6” 1018 round bars. And now including 3″ sq & 4″ sq 1018 bars. Click here to learn even more about CD and other cold finished bars. Watch the videos below to see cold drawing in action!